This case study took place in a national movie theater cineplex located in Colorado. Musty odors prompted the facility manager to bring in a mold air quality testing company. As you can see in the photo on the left, the mold tests confirmed the manager’s suspicions. Mold had clearly become a big mold problem in his theater seating areas as well as in his lobby. His employees and patrons were dangerously at risk for getting toxic black mold allergy symptoms. The manager called in a mold remediation contractor to clean up the mold problem. 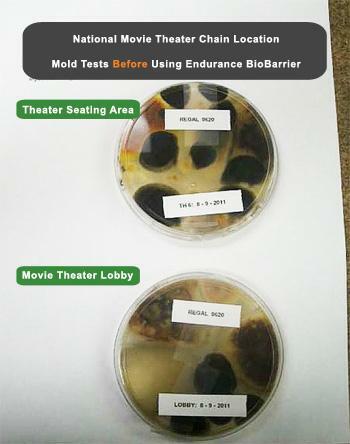 Luckily for this theater manager, this contractor was one of the first mold remediation service providers to test and then begin using Endurance BioBarrier Mold Prevention Spray. 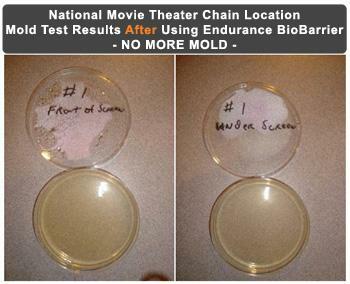 After cleaning all surfaces, Endurance BioBarrier was sprayed onto carpets, curtains, seats, walls, and floors. All areas and surfaces were treated. Soon after the completion of this mold removal and mold prevention project, air samples were taken. As you can see in the second photo here, Endurance BioBarrier was the answer for how to fix the mold problem and how to prevent mold from returning.